How to: Account, Invoice, and Order Management - How to manage payment, auto-payment, change games, or stop your service. Server Saved Files - Need to download your data? Here's how and where to find it! ARK: Bugs and Glitches - Running into issues with ARK or the server in general? Check here first! ARK PC: Transferring Singleplayer data to Multiplayer - Have a singleplayer game that you want to show off to your friends? ARK PC: Custom Launch Parameters - How to setup custom maps, Primitive+, and other modding / overhaul features. 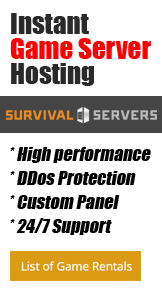 ARK PC: Popular Mods - Want to spice up your server? Check out an example of popular mods available from the Steam workshop! Unturned Custom Maps and Mods - How to add in custom maps and mods for your Unturned server. CPBO - ARMA - Unpack / Pack your server and mission PBO properly. Note - Dart functionality for DayZ is limited compared to ARMA. EPM - ARMA 2 & 3 - Easy to use RCON tool. Allows for kick/bans and global admin messaging. PboManager - ARMA 2 & 3 - Unpack / Repack your server and mission PBO files properly. Gotcha - DayZ - Advanced admin controls, click for more info.